Shoulder dislocations are quite common. They occur in 3 broad groups of people as described by the Stanmore triangle. People who have a normal shoulder just prior to dislocation. This is the commonest group. Typically this occurs in young adults involved in high energy sporting injury such as rugby players, judo competitors and those falling off bikes and horses. The dislocation causes the stabilisting ligaments (labrum) of the shoulder to tear. Sometimes an operation is required to repair the ligaments so that the shoulder does not dislocate recurrently. People who have a loose shoulder just prior to dislocation. Some people have naturally loose shoulders, typically this is in teenage girls. Some sportspeople also have very loose shoulders which allows them to excel at swimming, throwing and gymnastics. 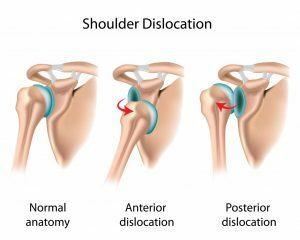 If your shoulder is already very loose then it is more prone to dislocating and may require only a relatively minor injury to do so. Treatment usually starts with physiotherapy and only occasionally requires an operation. People who can pull their shoulders out of joint without any injury. It happens when the wrong muscles forcibly contract at the wrong moment and it pulls the shoulder out of joint. It may be completely painless. This is a problem which can only be addressed with specialist physiotherapy. Those people with type I injuries (group 1 above) need to have an xray to ensure there there hasn’t been a fracture associated with the dislocation. In people over 40 it is imperative that they also have a scan of their rotator cuff (MRI or ultrasound) as there is a high association with rotator cuff tears. It is also important, in everyone, to have a doctor check the functioning of your nerves as it is quite common to injure important nerves around the shoulder during a dislocation. If you have had an xray when your shoulder is dislocated it will be apparent whether you had sustained an anterior (common) dislocation or a posterior (uncommon) dislocation. The direction of the dislocation will have a bearing on how you are managed. Treatment will depend on a multitude of factors. The most important of which relate to your age, the type of sport you play and the extent of the internal injuries. As a young rugby player, for example, it is very likely that you would go on to dislocate recurrently unless you have an operation to repair the internal damage. However if you are an older adult who does not play collision sport then it is likely that a period of rest then physiotherapy will allow you to recover full function without the need for surgery. Unless you have sustained a rotator cuff tear in which case you may well need an operation. The extent of the internal injury can be assessed with an MRI scan. In this video Harry talks more about shoulder dislocation and management of this complex problem. If surgery is required then it is usually performed arthroscopically under general anaesthetic as a daycase procedure. You will need to be in a sling for 6 weeks after the operation and it would be about 6 months before you are allowed to return to collision sport. For this reason most rugby players usually choose to have their operation either early in the season or toward the end of the season so that they are ready for the next pre-season training. Harry has performed 479 shoulder stabilisation operations. You can read more about stabilisation surgery here. Post-op physiotherapy protocols can be found here for arthroscopic stabilisation and Laterjet procedure.